For your initial trips you do not need to buy specialised canoeing clothing or equipment. Most people will have suitable clothing for use on their initial trips. 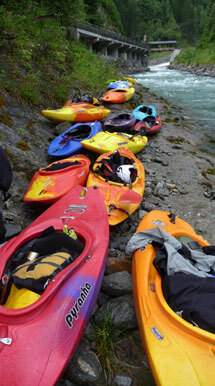 After a while and once you are hooked on kayaking, you may want to consider buying some of your own clothing and kit. Initially you can just use club kit and your own clothing. If you want to buy some of your own clothing or kit then get advise from some of the more experienced members before splashing out with the cash! The table below show what you may need to bring on a trip depending on what time of year it is etc. The list is fairly extensive but initially you can use whatever clothing you have. If you only intend to paddle flat water in the summer months then you will not need to bring any specialised clothing. However if you intend to paddle white water or surf in the winter months then you will need to use more specialised clothing. Old tracksuit botton or preferably synthetic base layer leggings which can be bought at an outdoor shop. Cheap alternative to a drysuit for use on white water and surf trips. If it is your first trip, the person leading/driving will assist in making sure that you are fully kitted out. However it is always the responsibility of the individual to ensure they have what they need and to return it to wherever it came from, (sometimes members supplement club kit with their own spare kit, please ensure it is returned in the same state). Are there holes in the boat? Is the drain plug correctly fitted? Are the paddles about to break? Are there airbags fitted and fully inflated to the boat? These are an important safety feature. If hiring Club equipment - you'll need boat, paddle, spraydeck, buoyancy aid, helmet, cagoule. Please remember to pay the trip organiser the appropriate kit hire monies. Please ensure that the kit fits you, (i.e. you can fit into the kayak, the Bouyency Aid can be adjusted to fit you, the spraydeck is the correct waist size and cockpit size, the helmet fits and that the paddle is correct feather and left/right hand control as required). If you take ill fitting kit you may not be able to paddle! If in doubt ask a more experienced member. Please treat all club kit as if it were your own and report any problems to the organiser or to the kit officer, (e.g. broken footrest, missing airgbags, etc).